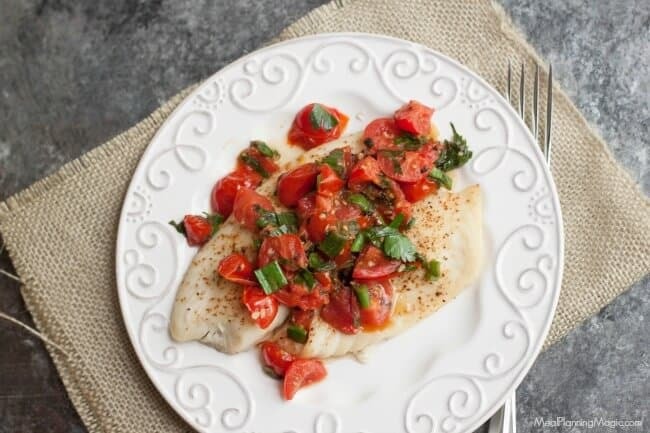 Super Simple Tomato Basil Topped Baked Fish tastes delicious and is budget friendly too! I first shared this post over four years ago and have updated it with new photos and content. This recipe is still one of my favorites! Several years ago, I joined 200 other food bloggers in the Food Bloggers Against Hunger campaign and challenge to highlight the fact that hunger in America is an ongoing problem that needs to be addressed. 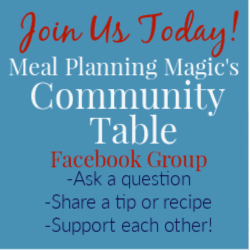 As part of the challenge, I was asked to make a budget-friendly meal based on the monetary restrictions that a family of my size would receive if we were participating in the SNAP (food stamp) program, which at the time was $4 per person per day. Since there are four members in my family, that meant I had a budget of $16 for my meal. Now before you think that might seem impossible, read on! I decided to make Super Simple Tomato Basil Topped Baked Fish. If you’re a smart shopper, you can find a tasty white fish for a great price per pound that believe it or not allows you to eat a healthy meal on a budget! I have found white fish (like tilapia, cod or flounder) for as little as $5 per pound but generally for about $7-$8 per pound. For my family of four, just one pound is all it takes to feed us when I add a side and vegetable (especially when I shop sales for those items as well!) So I can generally make this meal for about $10 for four servings and which is great because it’s below my budget! If you’ve got a garden where you’re growing some of the vegetables and herbs like tomato, green onions or basil like I do, you can make it for even more budget friendly! 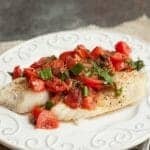 I first discovered this recipe for Simple Tomato Basil Topped Baked Fish many (many!) years ago when I was in college. It was a simple recipe that I could make easily in my apartment and I knew it was good for me too. 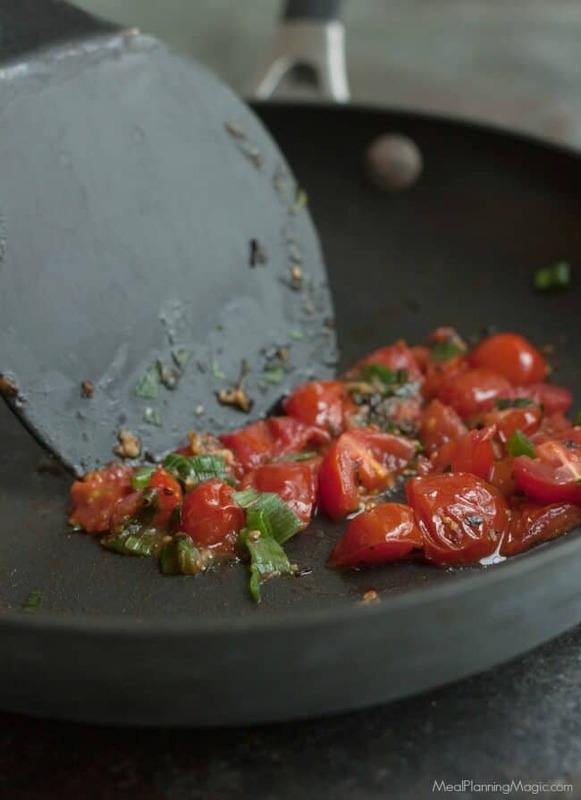 It only takes a few minutes to chop up the tomatoes. You can sauté them and the rest of the ingredients while the fish is baking and you’ll have dinner to the table in under 30 minutes for sure! 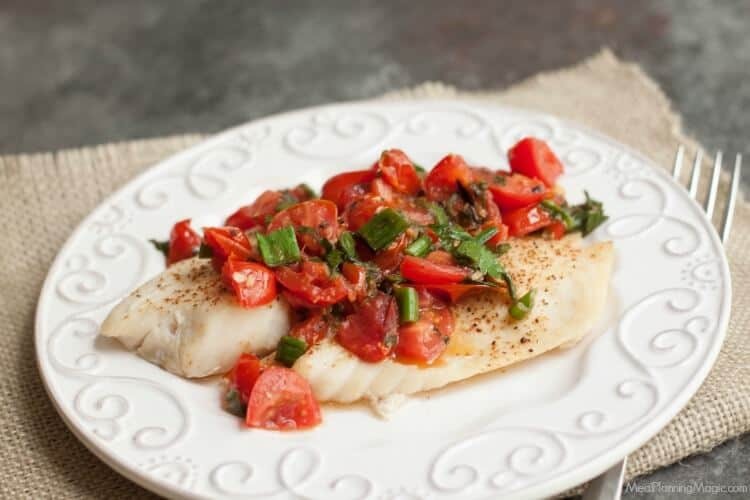 I like to pair this Simple Tomato Basil Topped Baked Fish with yummy Simple Stovetop Brown and Wild Rice Pilaf or Roasted Rosemary Potatoes and roasted broccoli or Simple Garlic Green Beans. When you shop sales for these ingredients you’ll find that eating well can still be budget friendly! Meanwhile, in large sauté pan, sauté green onions and garlic in olive oil in a medium skillet until tender. Add parsley, dried basil, salt and cook over low heat until thoroughly heated. 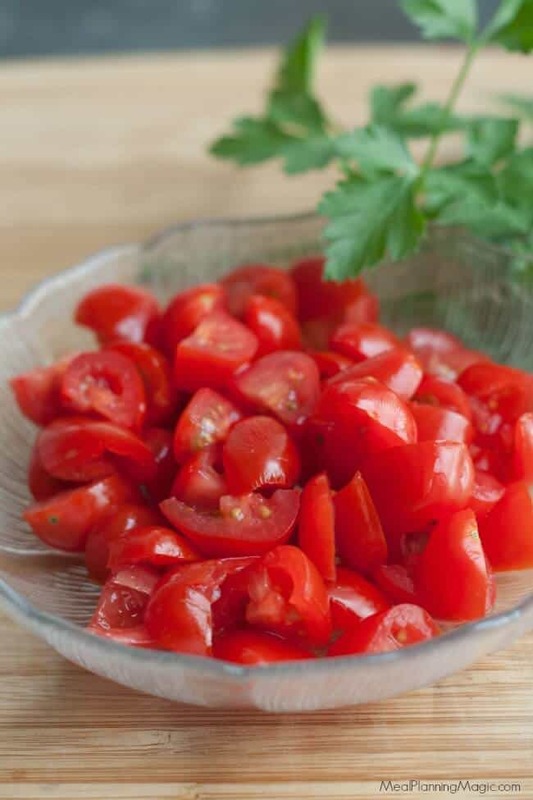 Remove from heat; stir in tomato & set aside. Cover baking pan with foil (optional). 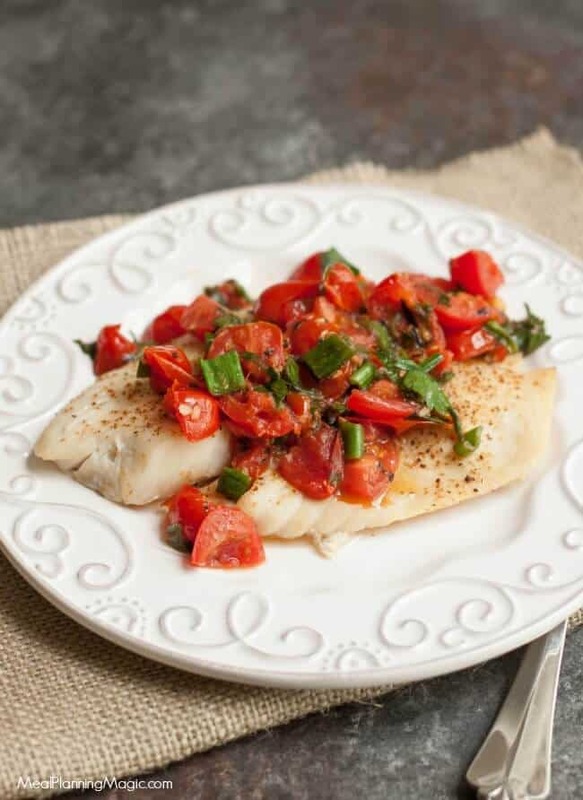 Place fish on pan and sprinkle each filet with all-season spice blend. Bake fish for 20-25 minutes or until it flakes easily with a fork. Top each fillet with 1/4 cup tomato mixture and serve. While I’m always glad to share a budget friendly recipe with you, today’s post is about more than that. In our country, we are overweight yet undernourished due to poverty and our food supply. Many people on a fixed income believe that they cannot prepare healthy meals on a budget and then turn to convenience and packaged foods instead. Food insecurity is not just an urban problem. It occurs in more than 2 million rural households too. And the US spends$190 billion in health care and lost productivity as a result of obesity. Share Our Strength, the non-profit organization that helps address and combat hunger in America has put out a call to action asking for your help in letting your representative in Congress know that you think federal spending cuts should NOT be made and that nutrition programs for those in need should be available. Many thanks to Nicole Gulotta, founder of The Giving Table for coordinating this group of bloggers and for helping us to get the word out. Be sure to check out the Pinterest board for today’s posts by all the other bloggers to get more budget friendly ideas. I hope this post will inspire you to try a new recipe but more importantly, let your voice be heard about hunger in America.